Sawtooth Adventure Company’s (YAP) Youth Adventure Programs are designed and influenced through Jared’s (SAC Owner) experience as a Lead Instructor for the University of Utah’s Outdoor Recreation Program & National Outdoor Leadership Insturctor. The goal of SAC’s Youth Adventure Programs is to offer leadership and educational opportunities while participating in an adventurous wilderness experience. Our programs are designed to introduce 12-19 year olds to river rafting and kayaking in a safe and controlled environment. We customize every YAP to accomodate your groups needs. Have specific need? Just ask us we can likely accomodate you. SAC will secure an improved campsite along the Salmon River prior to arrival. Nightly Camp charge is included. Groups can add Fly Fishing, Mountain Biking, Rock Climbing or Trail rides for an additional charge. Food Planning, Camp Chef, Camp Equipment and Custom Itineraries are available. 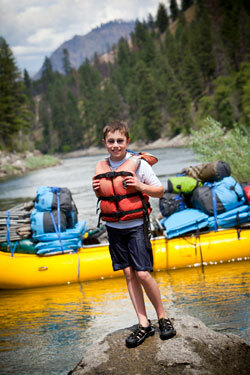 SAC provides all equipment needed for river adventures including PFD, wetsuits, booties, splash gear, fleece, etc. Group leaders will be expected to provide transportation, supervision and active participation in all activities throughout the program. We can accommodate group sizes ranging 6-48. Custom Trips are available. SAC will work with leaders to plan logistics for the entire program.